We have found from our customers, that is a very common request to let application developers see the data only from the OpenShift Projects and Kubernetes Namespaces, that they are working on. In this blog post we will show you how you can do that with Splunk roles. 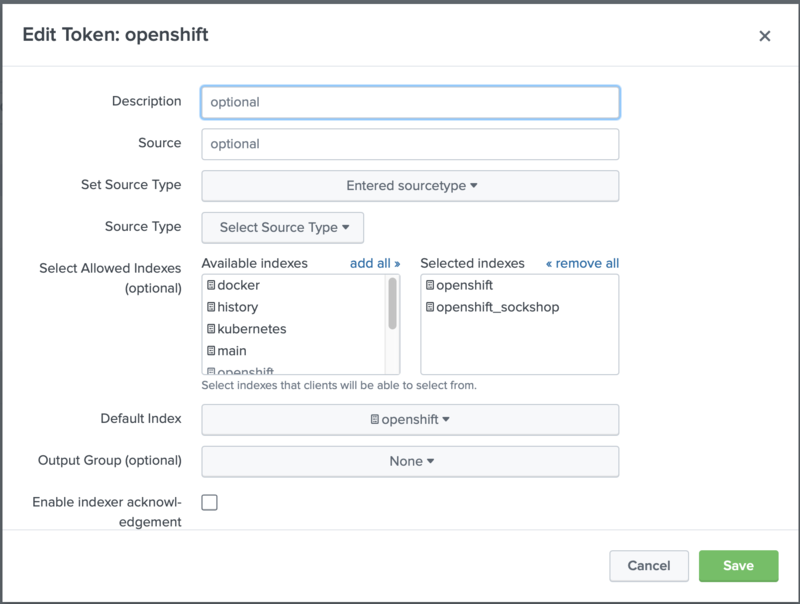 We will use OpenShift as an example, but you can follow the same guidance to perform the same on Kubernetes namespaces. There are two ways how you can restrict access to the data using Splunk roles. One is by indexes, and the second one is by applying restrictions on search terms. We will use a Project named sock-shop as an example. To be able to restrict access to the logs and metrics that are generated by the Pods running inside of this Project at first we need to create a new index in Splunk. As you can see, currently we have two indexes openshift and openshift_sockshop. First one is a default index, where we redirect all data, and the second index will be used for forwarding only data from the sock-shop Project. We recommend prefixing all the indexes that are used for storing data forwarded from OpenShift similarly, like openshift_ or os_. In that way it will be much easier to modify the macros and saved searches to adjust which indexes you will be able to see. We will show you later on example. 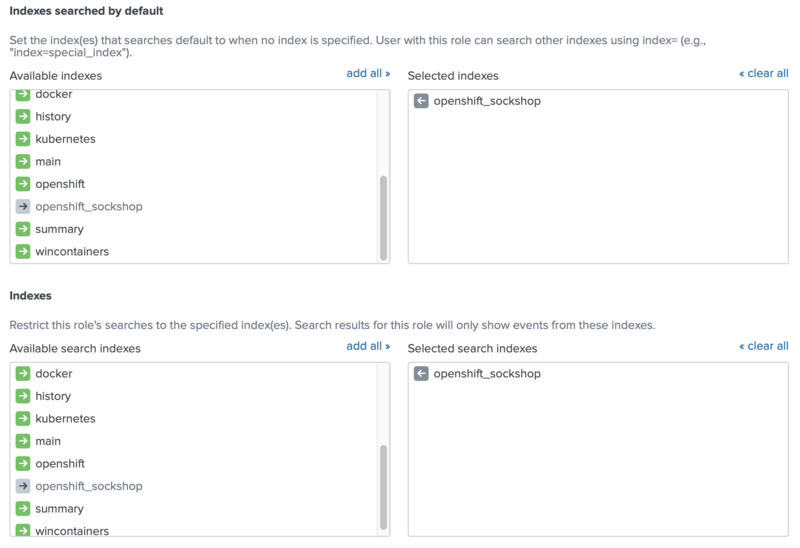 If you have a distributed Splunk HTTP Event Collector and you don't use Splunk Deployment Server, you will need to modify the inputs.conf and add index openshift_sockshop to the list of indexes. Splunk is ready now to accept data to the openshift_sockshop index. You can find that after doing this change you might not see the data in Splunk for this project. The reason for that, because our search macros are looking only in indexes searched by default. You have two options: make the newly created index to be searchable by default, or modify the search macros. See Monitoring OpenShift. Configuring Splunk Indexes for details. The next step is to create a role in Splunk, that will be able to see only the sock-shop Project. We will use the user role as an example. The only change we will do is to specify which indexes this role can see. Each log event and metric point from the Pods have metadata attached to it, which includes the field openshift_namespace. We can leverage this indexed field and the Splunk Search Restrictions to be able to show only one project to the Splunk user. Important note about this method from Securing Splunk Enterprise > Add and edit roles with Splunk Web. Search term restrictions offer limited security. A user can override some search term restrictions if they create a calculated field that references a field name listed here as a restricted term. With this calculated field you cannot see the logs outside of your project when you specify a Search Term Restriction like openshift_namespace::guestbook, because this term is looking only for indexed fields. If you change it to openshift_namespace=guestbook, you will be able to see the logs from other namespaces by using the calculated field as in the example above. Both methods allow you to restrict which projects a user can see with Splunk. 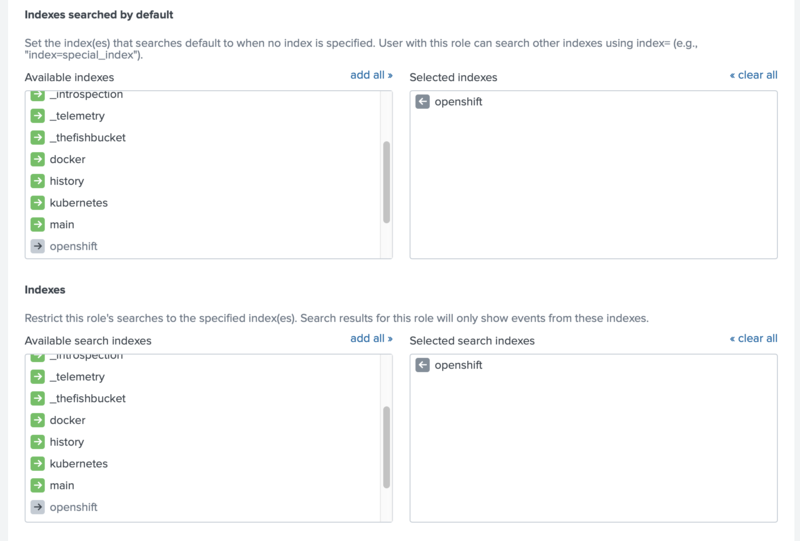 Splunk claims that restriction with Search Terms is not very secure, but we could not find how to escape the existing Project, when openshift_namespace is an indexed field. The method with restricting by indexes gives you more flexibility. You can decide for each index how long you want to retain the data. If one team is logging much more than the other, that will not affect performance for the teams, as each team will have its index. Of course managing one index per Project might require more configurations on both sides, OpenShift and Splunk as well.